When you’re thinking about that next adventure vacation, then you’ve got to head down to South America. 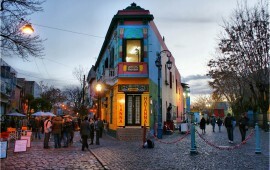 And if you’ve never been to this beautiful continent before, then your first stop should be Buenos Aires. This city, one of the most popular cities in all of Argentina , is known for being incredibly rich in history, having some of the most spectacular sites that are unlike any other, and for its friendly and relaxed atmosphere. When you want to enjoy all that Buenos Aires, one of the most popular cities in South America, has to offer, we have many South American vacation packages that will get you there – and that will do it for less. Our Iguazu Falls vacation package is undoubtedly one of our best and most popular South American vacation packages. With this package, not only will you get to spend over a week in beautiful Buenos Aires, but you’ll be able to do it for incredibly cheap, and of course, have your flights and accommodations taken care of. Of course, because we wants to make your Iguazu Falls trip as memorable as possible, we also make sure that you have all the little extras you’d expect from a paradise vacation, including guided tours, daily breakfasts, and even airport transfers – because our vacation packages in Buenos Aires always ensure that you never have to worry about the little stuff. For those who want a South American vacation package that will allow them access to the finest shops and truly authentic and gourmet cuisine, we have other vacation packages in Buenos Aires, and our Pestana Buenos Aires Hotel may be just the thing. This South American package is available for even less, and still gives you over a week’s time in the beautiful city of Buenos Aires. Buenos Aires offers excitement for those who are looking for great nightlife and stunning beauty for those who are looking for a vacation filled with unique scenery. And Buenos Aires isn’t the only exciting city you should discover in Argentina. Bariloche, Calafate, Ushuaia, Mendosa are all unique regions that offer something different. Ski on the beautiful peaks in Bariloche, then visit the glaciers in Calafate, and then end it all at the end of the world – the door to Antarctica, beautiful Ushuaia. We have a package that’s a winter’s delight, and it all takes place in Argentina! Don’t miss out on Buenos Aires and everything else that beautiful Argentina has to offer! Start the booking process today, and start finding corners of the world you never even knew existed!